Dragonflies have adorned everything from Tiffany lamps to arts and crafts ceramics. Their luminescent beauty and mystique have endured over the decades and continue to pique the imaginations of those who seek nature-inspired décor touches. This quick and easy craft yields a stunning and multi-hued dragonfly figure. Crafters can choose one or two shades of the same color for the dragonfly bodies but should feel free to let the species' kaleidoscopic wing colors inspire. They contain indigo, green, gold, black, purple, orange and other hues. The project can also be made in different sizes, so a grouping on an outdoor dining table or library bookshelf will add a singular loveliness. - Painted, wooden jewelry-making beads in two sizes with holes. 1. Put on gloves and then measure and cut two to three feet of barbed wire with the wire cutters from the barbwire spool. 2. Cut a 6- to 8-inch piece of wire from this longer piece. 3. 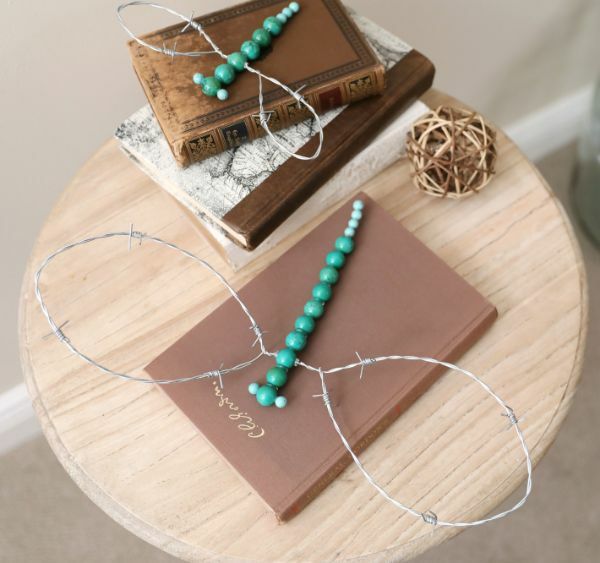 Bend the piece of wire into a football shape, so each end is pointed and the two sides are curved. 4. 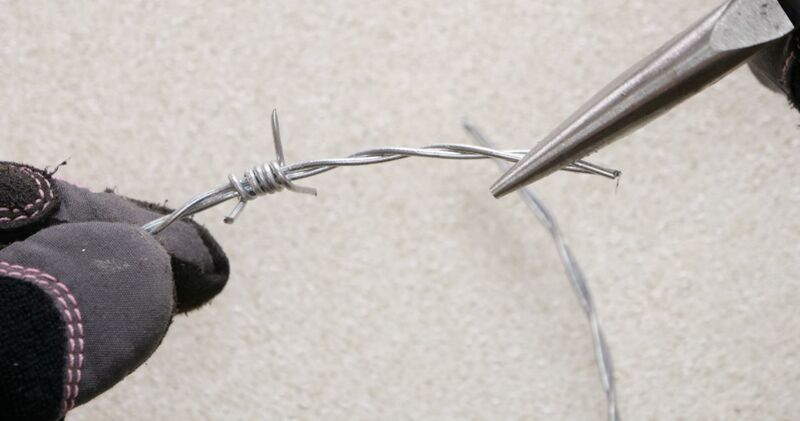 Unravel about half an inch of the two fused barbwire end pieces with the needle-nosed pliers. Each end will be composed of two separated single wire lengths. 5. Trim about half an inch from one of the single wire pieces on each end with the wire cutters. The ends should now be single slender wire pieces. 6. Wrap one of the single barbwire ends to the other with the needle-nosed pliers so it twists around it. 7. Clip off the small bits of excess wire at the end of the fused barbwire pieces with the wire cutters. The piece will now be a pointed oval but with a short bit of fused barbwire protruding from one end. This will be the dragonfly’s wing. 8. Repeat Steps 2 to 7 so you have two wings. 9. Fill one of the bowls with the large beads and the other bowl with the smaller beads. 10. Affix 10 large beads together with the hot glue gun, one after the other, so the beads form a straight line. This will be the dragonfly’s body. Ensure that the bead holes are oriented so they are on the right and left sides of the form, rather than gluing the ends with the holes together. Allow the glue to dry. 11. Affix four small beads to one end of the dragonfly body; this will form the tail. 12. Glue one small bead to either side of the large bead on the other end of the body (the dragonfly’s head). Allow the glue to dry. 13. Apply glue into the bead hole on either side of the third large bead down from the dragonfly’s head. 14. Insert a wing end into each hole. 15. Wait to display the dragonfly until the glue dries.